A phrase that I occasionally use is “That’s their ‘Gypsys, Tramps, and Thieves’!” What I mean is maybe I don’t like the rest of the band’s work, but that one song they have is undeniably good (“Shiver” from Coldplay, for example). I think the first time I heard this song was in The X-Files, and I can’t quite explain why, but I thought it was brilliant. It certainly had a storyline, a wonderful protagonist, and nice atmosphere. It worked in gypsy music elements, but also felt like a pop song. And Cher passed it all off like it was nothing at all– with a little bite and sass to it. Now I’m not a Cher hater, but I sure don’t love her, either. Her music is good for what she does, but what she does isn’t my cup of tea. But then there’s this song– who knows, I could love the whole album– that I can’t deny. The X-Files went on to have a whole episode that threaded Cher into it, which was amazing. 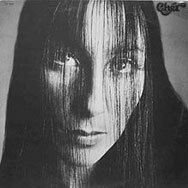 I never really sat down and dug into Cher as an icon, but the simple fact that she related this song so well makes me respect her as an artist (and the icon that I suppose she is).